Rolling pins are an essential part of your kitchen accessories, but especially so if you spend any time baking. They help you to easily roll out sweet or savory dough, for the perfect sugar cookies, pastry, pizza bases, and even pasta. We reviewed dozens of rolling pins to identify the best of the best. Features we considered included the material of the rolling pin, whether it has handles, the length of the pin, and how easy it is to clean. Our top pick is the Joseph Joseph Adjustable Rolling Pin with Removable Rings. This stylish rolling pin not only looks good, but it allows you to easily roll out dough of the perfect thickness, thanks to the removable rings attached to either end. The Joseph Joseph Adjustable Rolling Pin with Removable Rings takes the guesswork out of rolling your pastry to the perfect thickness. As it comes complete with four sets of removable discs, which raise the surface of the rolling pin by different amounts. Choose from 3/8 inch, 1/4 inch, 1/6 inch, and 1/16 inch. Simply unscrew the ends to change discs, or remove them all if you’d like to practice your freehand rolling skills. The discs are held in place with plastic screws, ensuring that your dough is a uniform thickness is great for perfectly baked cookies, pie crusts, and pizzas. This rolling pin also comes with measurements on the wooden surface, so you can easily cut your dough to the precise size you require. The wood used for this rolling pin is beech, which can easily be cared for by washing in soapy water. This Checkered Chef Stainless Steel Rolling Pin will help you discover the secret to consistently smooth dough. The answer lies in the ability to cool your rolling pin in the freezer. This means the butter in the dough is kept at a lower temperature, which helps you to roll the perfect dough. The hollow core of this rolling pin is designed to keep the pin light, while also preventing the transfer of heat from your hands. This keeps the rolling pin cooler for longer. With a generous 15 3/4 inch length, this professional-sized rolling pin means you can easily create large pizzas, and pie crusts with ease. Maintaining this rolling pin after you’ve used it is also quick and easy. Simply wash by hand, or even better, pop it in the washing machine and watch it come out sparkling! The french design of this rolling pin provides a high level of control, without the need for excessive force. 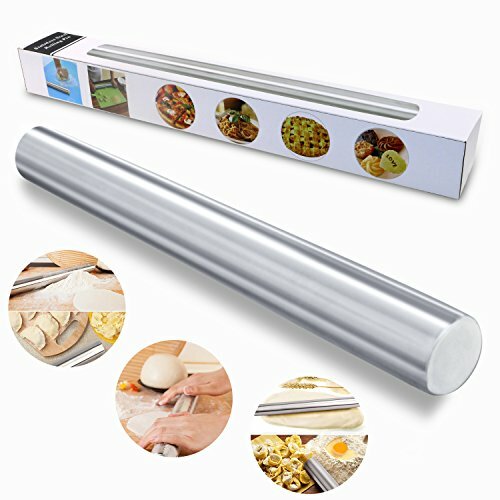 The TedGem Stainless Steel Rolling Pin provides a quality product for a bargain price. This rolling pin is made from food grade stainless steel, which will never crack, or split. The non-porous surface also means it won’t absorb colors, flavors, or pick up harmful bacteria and fungus. The smooth stainless steel provides the perfect non-stick finish, and also has the added advantage that you can place it in the freezer for rolling puff pastry, or warm it up in hot water to roll out stiff icing. The handle-free design is created with the aim of giving you more control, whilst also requiring the use of less force. Its durable construction means you’ll be using this rolling pin for many years to come, without the worry of maintaining it with regular oiling. The smooth rolling action takes unnecessary pressure off your wrists, making it easier than ever to achieve the perfect dough. The Good Cook Classic Wood Rolling Pin is a great choice for any cook. The handles on this rolling pin allow you to roll out a variety of pastries with ease, thanks to the nylon bearings which keep everything moving smoothly. The one piece barrel is made from a high quality hardwood, which will last for years. Simply wash with mild soapy water, and dry naturally, away from heat sources. The affordable price of this wooden rolling pin by Good Cook means it’s a great entry level choice if you’re new to baking, and are looking for an affordable, starter rolling pin. The Fox Run Marble French Rolling Pin is a great choice if you’re looking for a unique, quality rolling pin. Marble does not absorb any fats, odors, or moisture from foods. The natural non-stick properties of marble also mean that there is less chance of your dough sticking. The classic dowel design of this Fox Run marble rolling pin means that you can use it with resistance discs too ensure a perfectly even thickness of dough. The heavy weight also means rolling out your dough is a much easier task, and requires less work from you. Marble is valued by professional chefs as a great choice of material for your rolling pin. This is because it stays cooler at room temperature, which helps to stop your dough from sticking. For even better results, you can pop your marble rolling pin into the refrigerator for 30 minutes before use. If you enjoy cooking in any shape or form, then it’s likely at some point that you’ll need a rolling pin. Making your dough can be pretty simple, especially if you have a stand mixer with a dough hook. Many recipes then call for rolling out dough, whether you’re making a key lime pie, or home-made pizza bases. While it is possible to try and flatten dough without a rolling pin, you’ll most likely end up with thick and thin patches. This means your dough will cook unevenly, which results in burnt patches in certain places, and under cooked dough in others. Rolling pins can be bought for as little as $5, although there are many more luxury options out there as well. The type of baking or cooking you do may well influence the type of rolling pin you decide to purchase. A rolling pin should have a few important features. Here’s what to consider when selecting a rolling pin to suit your needs. Material. Rolling pins come in a wide variety of different materials, with some of the most common being wood, stainless steel, marble, aluminium, and plastic, to name a few. Some bakers like a wooden rolling pin because of its versatility, others prefer marble or aluminium, due to the ability to change the temperature of these pins to suit different types of dough, such as puff pastry. Weight. Some rolling pins are very lightweight, others are a lot heavier. Lighter pins can take more pressure to flatten the dough. Heavier rolling pins are often made from marble and require less pressure, but can be harder to maneuver. Resistance discs. If your recipe calls for a dough of a specific thickness, it can be tricky to achieve. Resistance discs solve this problem by securing onto the ends of your rolling pin and raising it a set height from the bench. Simply roll your dough until the discs touch your work surface. Some rolling pins come complete with discs, or you can buy them separately. Bear in mind these will only work with non-tapered French rolling pins. Roller with handles. Roller type rolling pins have two handles at either end, with a thicker central cylinder which rotates independently. These are comfortable to use, not too heavy, and are very versatile. Rod rolling pins. These are also known as “French” rolling pins. They are often made from a rod of wood, typically around 3 cm in diameter. Sometimes the ends are tapered, and other times the rod is the same diameter across the full length. These rolling pins are very maneuverable and perfect for precision tasks. What is a rolling pin and how does it work? Rolling pins are cylinders made from a wide variety of materials, including wood, plastic, stainless steel, or marble. Some rolling pins have handles at each end, others are tapered batons without handles. Rolling pins are designed to help you roll your dough out to an even thickness. They achieve this by applying pressure across the surface of the dough, so as you press down on the pin while rolling, the dough flattens smoothly underneath the pin. How do you roll dough with a rolling pin? Once you’ve made your dough, place it on a large, flat surface in your kitchen. Dust the surface, and your rolling pin, with a light coating of flour. Shape your dough into a rough circle, and put it on your floured surface, towards the middle. Use the rolling pin, or your hands, to press the dough into a circle of around 2.5 cm thick. Now, using your rolling pin roll the dough using firm but gentle strokes. It helps to turn the dough after every few rolls, to help maintain the circular shape of the dough. Dust your surface and rolling pin with flour at the same time, to help prevent sticking. Continue rolling until your dough is the thickness or size you want. How do you make a rolling pin not stick? One tip is to make sure your rolling pin is dry before using. Any moisture will mean your dough is more likely to stick. Keeping your rolling pin and dough covered in a light coating of flour will also ensure that your pin doesn’t stick to the dough. How do you clean a rolling pin? The best method to clean your rolling pin is to wipe any flour and bits of leftover dough from your rolling pin, using a dry paper towel or cloth. It’s best to do as as soon as you’ve finished using your rolling pin. Next, use a damp washcloth to wipe it clean. Then dry it, and you’re done! If you want to give your rolling pin a deeper clean, you can use mild dishwashing detergent, or use one tablespoon of bleach in a gallon of water. Never place a wooden rolling pin in the dishwasher, as the heat will irreparably damage the wood. Once a year, it’s a good idea to season your wooden rolling pin by rubbing a small amount of food grade mineral oil into the rolling pin, using a soft cloth. We looked at 20 other rolling pins. Even though they didn’t make our 5 best rolling pins, they’re still the best of the rest and each is still a great option for your kitchen. The information you’ll need to compare each one is included with the listing. 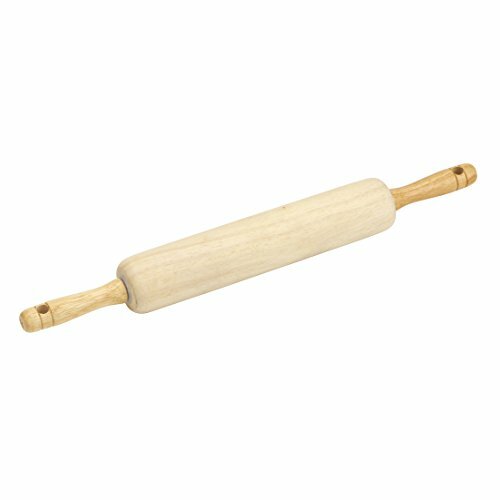 If your children are keen on baking, this mini rolling pin is a great way to let the help out in the kitchen. This traditional wooden rolling pin, with handles is the perfect rolling pin for family baking projects. This premium beech wood rolling pin has a beautiful burnished surface for easy rolling. This beautiful maple rolling pin comes with waxed, easy-grip handles. The self-lubricating bearings mean this pin will provide a lifetime of smooth rolling. 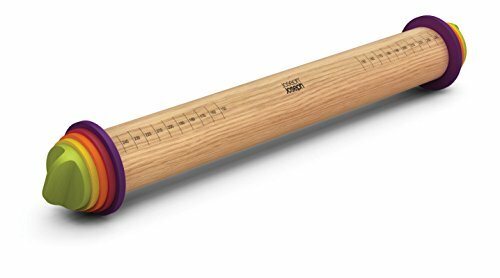 If you’re looking for an affordable wooden rolling pin with adjustable discs, this pin is a great choice. This beautiful, hand-crafted marble rolling pin comes complete with a wooden cradle to store it when not in use. 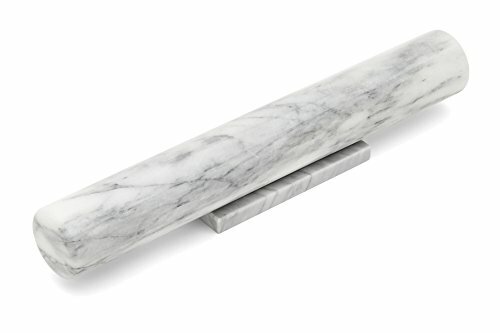 This beautiful, white marble rolling pin is an elegant addition to your kitchen, while also being easy to clean. This beautiful, hand-crafted French rolling pin is made from natural jade marble. The polished wooden handles of this marble rolling pin help to support the weight of the marble, making rolling dough seem almost effortless. The beautiful gray marble of this rolling pin is accented with stylish cast aluminium handles. This rolling pin is embossed with a fun gingerbread man print, perfect for holiday cookies. With a fun pattern of cute cats, this rolling pin would make the perfect housewarming gift for a cat lover. This fun set of 8 embossed rolling pins is perfect for adding decoration to cookies, icing, or pastry. This personalized pin comes complete with any name laser-engraved into the central barrel. This wooden rolling pin comes embossed with a beautiful springtime pattern, complete with butterflies and flowers. This beautiful, tapered French rolling pin is made from a combination of 5 solid pieces of hardwood: Jatoba, Ebony, and Maple. This maple wood French rolling pin has an easy grip for smooth and effortless rolling. This stunning French rolling pin is handcrafted from solid black walnut, featuring a striking Celtic knot design inlay, using sugar maple. This tapered French rolling pin is made from organic bamboo, a renewable resource known for its strength, density, and quality. 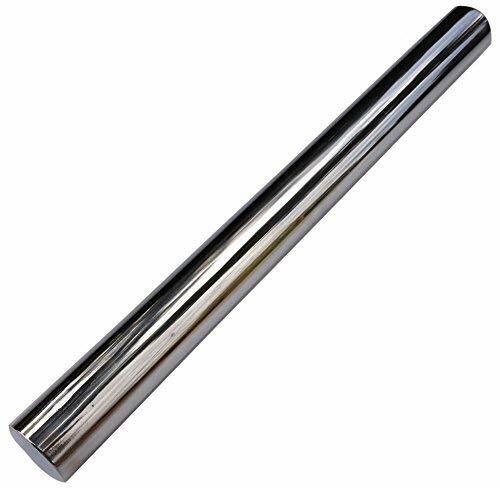 This stainless steel French rolling pin has a matte finish, and can be cooled in the freezer to keep your dough cooler for longer.